The Department of Physics and Astronomy offers two laboratory science, two-semester sequences in physics.One, Physics 141-142, is suitable for pre-med students and majors in other sciences; the other, calculus-based Physics 151-152 is appropriate for majors in physics, mathematics, computer science and chemistry, also for students who are pre-engineering. 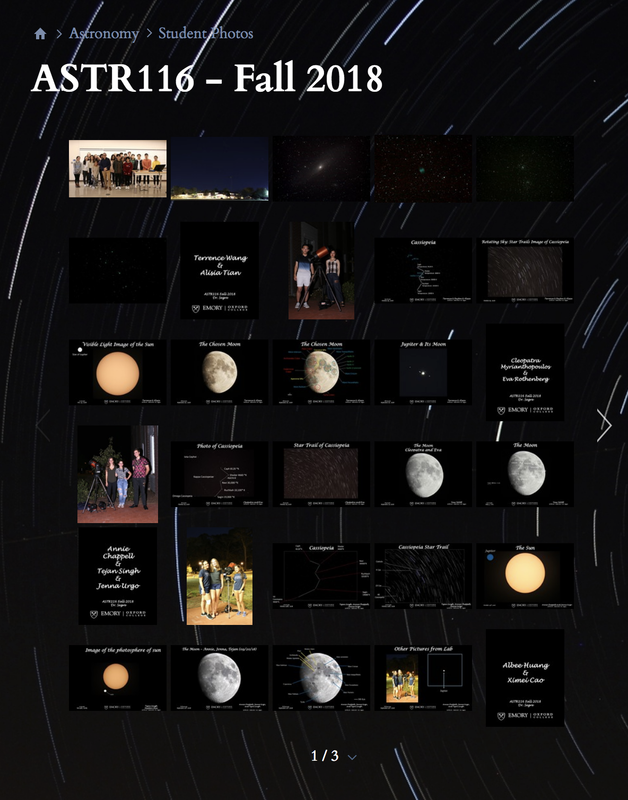 The Department offers a one-semester survey course in astronomy at least once each academic year. The lectures are visually-oriented and the laboratory incorporates both planetarium computer simulations and first-hand viewing, as often as weather permits. The Oxhouse estate near the campus is the primary viewing site. Check out theAstronomy Picture of the Day (APOD) and the Nine Planets. During advising periods, the director of undergraduate studies, Dr. Jed Brody, has a sign up sheet posted on his door. At other times during the school year, you can either e-mail or call him to discuss an appointment time. You can suggest a day and time in your email/voice mail; however, do not assume the time is confirmed until you hear back from him. The majority of pre-med students will fulfill their physics requirement after their freshmen year. However, pre-meds who want to keep a BS physics major open as an option, are advised to take calculus-based Physics 151 and 152 freshmen year. These answers cover significant points but should not be considered a substitute for one-on-one academic advising. 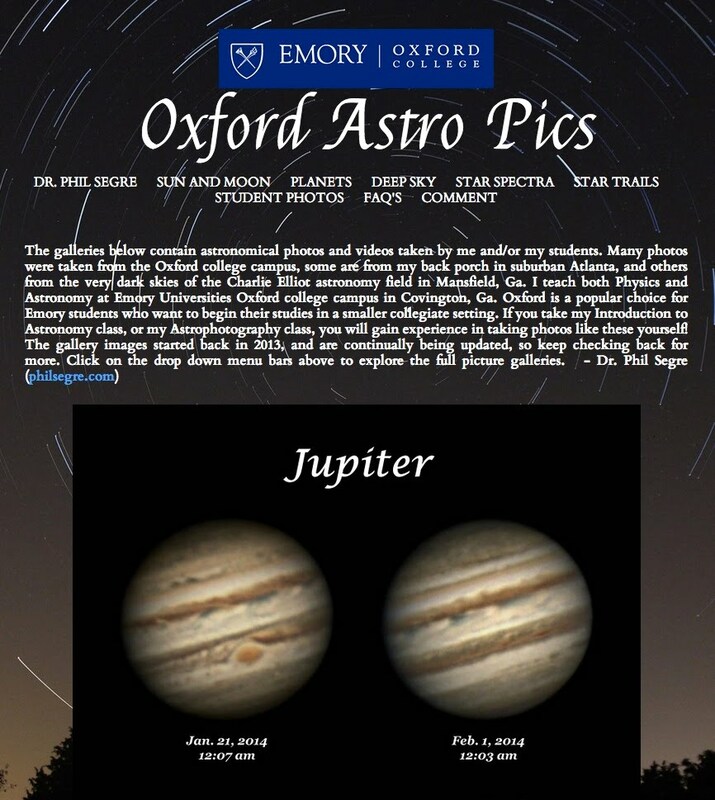 Any Emory student contemplating a physics or physics/astronomy major should schedule an appointment with the director of undergraduate studies as early in his or her academic career as possible. For a physics major, what are the main differences between the BS and the BA? The BS in Physics is a concentrated, mathematics-rich program for students planning on graduate education in physics or engineering. Therefore, BS students have more mathematics and physics requirements, continue to learn and apply higher-level mathematics throughout their program, and are required and encouraged to do more research than BA students. While covering the core physics curriculum, the BA in Physics requires fewer mathematics courses, fewer physics courses, and offers more choice in physics electives. It is well-suited for students planning to enter medicine, dentistry, law, business, science writing, and teaching. A very significant difference between the two programs is that BS students do not take Physics 254: Classical Physics. Instead, they take Physics 361: Analytical Mechanics I and Physics 365: Electromagnetic Fields I. (This is because Physics 254: Classical Physics combines these two courses into a single semester course designed for BA students.) Once a student has taken Physics 254, he or she is effectively on the BA schedule. In addition, the BA schedule works well for students who take Physics 151 and 152 as sophomores (or in some cases, juniors) rather than during their freshmen year. BS students, on the other hand, who do not take Physics 151 and 152 as freshmen will face a particularly challenging Fall semester in their junior year when they have to take three physics requirements instead of two. Having said that, many motivated students manage this late start well, so it should not prohibit qualified students from choosing the BS even if they take Physics 151 and 152 as sophomores or even juniors. Please see Degree Requirements for specific requirements and recommended schedules pertaining to each one. No student should attempt to choose either major without first speaking with the director of undergraduate studies. For physics/astronomy majors, what are the main differences between the BS and the BA degrees? The BS in Physics and Astronomy is designed for students planning on graduate school and a career in astronomy. Therefore, BS students have more mathematics and physics requirements, and they continue to learn and apply higher-level mathematics throughout their program. The BA in Physics and Astronomy is ideal for those students with a serious interest in astronomy who would prefer a program containing fewer mathematics requirements, fewer physics/astronomy requirements, and more electives than the BS. The BA is well-suited to students preparing to enter medicine, dentistry, law, business, science writing, secondary school teaching and multidisciplinary fields of science. Like the BS physics students, BS physics/astronomy students take Physics 361 and 365 (Analytical Mechanics I and Electromagnetic Fields I) instead of Physics 254: Classical Physics which is designed for BA students. Once a student has taken Physics 254, he or she is effectively on the BA schedule. BS students take both Physics 311 and 312 (Astrophysics I and II) whereas BA students can choose one or the other. 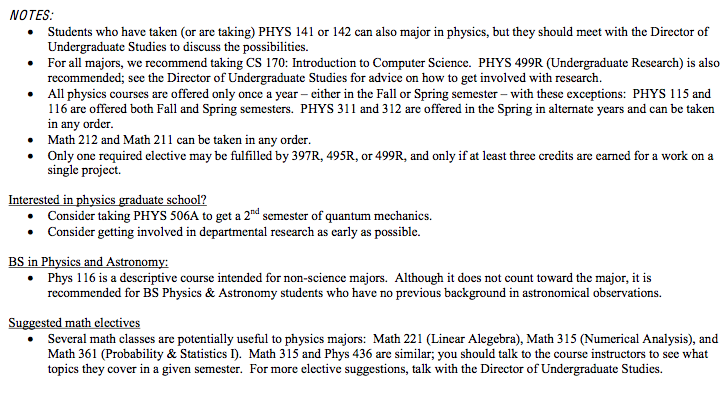 Physics 311 and 312 are not a sequence and may be taken in any order; they are offered in alternate Spring semesters. Please see Degree Requirements for specific requirements and recommended schedules pertaining to each one. No student should attempt to choose either major without first speaking with the director of undergraduate studies. Who should take the BS in Applied Physics? The BS degree was created for students whose interests lie at the interface between physics and contemporary high technology. The program offers a broad and deep background in physics and the accompanying mathematics, which is developed through the level of quantum mechanics, and which continues throughout the program. In the junior and senior years, this general background is applied to several areas of current technological interest, including digital electronics and microprocessors, computational physics, and optics and lasers. Please see Degree Requirements for details. Are there any physics courses that do not count toward the BS or BA degrees in physics? 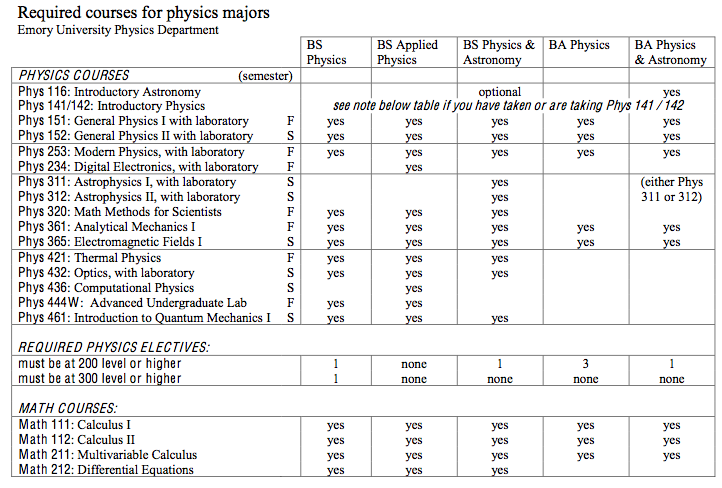 Physics 115, 116, 121, and 190 do not fulfill requirements for the BS or BA physics degree. [Physics 116, however, does fulfill a requirement for the BA in physics /astronomy.] Under special circumstances 141 and 142 may fulfill requirements for the physics or physics/astronomy major; this decision is made by the director of undergraduate studies. Normally, 141 and 142 are considered courses for non-science majors. If you have doubts about any other physics courses, please contact the director of undergraduate studies. When are required courses offered? All physics courses are offered only once a year—either in the Fall or Spring semester with these exceptions: Physics 115 and 116 which are offered both Fall and Spring semesters. Physics 311S and 312S are offered in the Spring in alternate years. Therefore, physics and physics/astronomy students follow the sequence of courses as presented on the recommended schedules. Schedules are offered for students beginning the major as Freshmen and for beginning the major as Sophomores. To see these schedules, please visit Degree Requirements.